I love to teach and share with you but I can’t always be at your guild or conference. With that in mind, I’ve developed the next, best way to inspire you. So….invite me into your home or studio to learn new ideas and techniques. My workshops are multi-lesson formats that combine PDF documents to print out – such as dye recipes and resources – and videos for you to watch and learn. You can watch them at your own pace, download them for future reference and work alongside me or take notes with a cup of coffee beside you! There will be opportunity for you to ask questions, post pictures and to meet other students and chat. Each workshop will be available to you forever and you will be able to keep the links to the videos or download the videos for anytime in the future. Browse through the workshops below and sign up! You are welcome to email me with any questions. I hope you will join me on this exciting new adventure! If you’d like further information and updates, be sure to sign up for my online newsletter – Design Notes – at the bottom of this page. I hope to see you soon! Read More . . . Wondering about the whole “online” thing? Here’s some of those Frequently Asked Questions: Read More . . . Explore the wonderful nuanced shades of neutrals you can achieve with black, grey and brown. Your personal colour palette will be enhanced with the addition of the warm / cool values and you will learn about the different colour casts of a variety of blacks. $60.00 Read More . . .
$30.00 Read More . . . This exciting workshop has been developed for quilters, stitchers, mixed media artists and everyone in between. 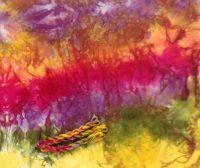 You will learn basic colour mixing theory using Procion MX dyes. 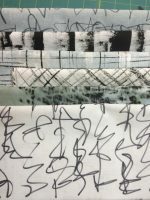 Then make simple colour gradations, colour to colour runs and develop a range of fabrics and threads using a planned palette showing value, tints and shades. You will learn how to prepare threads for dyeing by skeining and tying to keep them from tangling, what fabrics to use for dyeing and easy ways to rinse and wash your fabrics. Dye recipes and excellent written step by step instructions will be provided and there will be a focus on safe studio habits. $60 Read More . . .